Oh my! Lets not be chewing on those lamp cords. 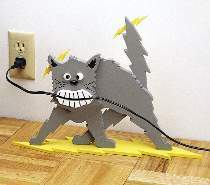 Your guests are guaranteed to smile when they spot this electrifying cat standing on tiptoes next to your wall. A one-of-a-kind project for anyone with a good sense of humor.